This is the first meal from the two rotisserie chickens.. I was going to make regular alfredo sauce, but a friend suggested I try cauliflower alfredo.. I found this recipe and it was simple enough. 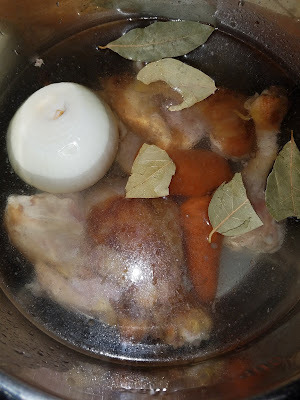 For the chicken broth that the recipe calls for, I cooked the four drumsticks and four wings (bags #4&5) in my instant pot with a carrot, onion, and a few bay leaves, filling enough water to the 10 cup mark. I cooked it for 30 minutes on the soup setting. The recipe calls for 6-7 cups of chicken broth to cook the cauliflower, but in the end you need only about one cup of it in the actual alfredo.. so I strained the rest of the broth back into the other left over broth and chicken. Froze it (along with the meat from the chicken wings) for another meal.. I'm thinking chicken quinoa. And for the alfredo, I added the meat from the four drumsticks. 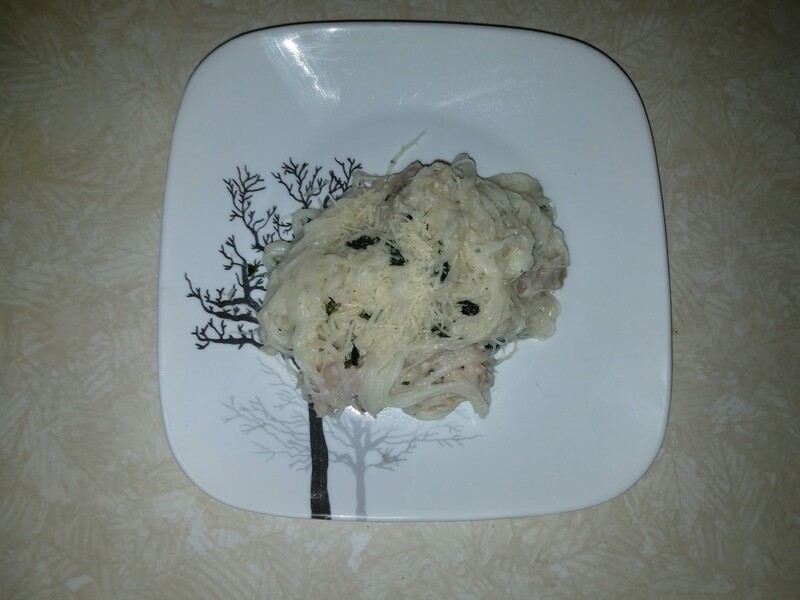 I let rice noodles sit in hot water until softened, strained, and added to the alfredo sauce with parsley, salt, and pepper. It was really good and none of the chickadees could believe that the sauce was cauliflower!